1 What is prickly pear (Opuntia ficus-indica = Cactus ficus-indica) ? 1.4 What is prickly pear used for? 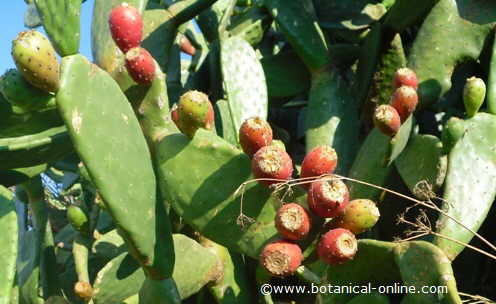 What is prickly pear (Opuntia ficus-indica = Cactus ficus-indica) ? 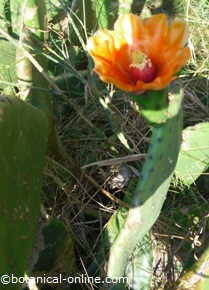 Common English name: mission cactus, nopal, prickly pear, cactus plant. 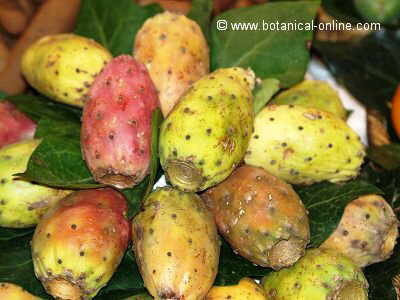 Indian fig, barbary fig (fruit). – Spanish: nopal, nopalera, tuna, chumbera, higuera de chumbo, pita, higuera de pala, palera, tunera, alquitira, cardón de México, choya, tasajillo. Fruits: higos picones, higos chumbos, tunas. – Catalan: figuera blade, figuera Moor, figuera Packed, Figuerassa, xumbos Figuera, figueres paleres. Etymology: The name of the genus, Opuntia, was assigned by Tourneforten (1700), because of the similarity to a thorny plant native to Opus, Greece. Ficus is the Latin name of the fig tree. – Cactus opuntia (L.) Guss. – Platyopuntia vulgaris (Mill.) F.Ritter. Origin: endemic genus of plants in the Americas and species native to Mexico, where the greatest variety of this plant species can be found. 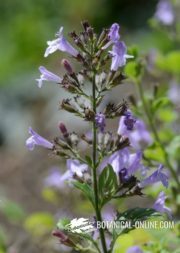 Habitat: xeric plant, which lives in arid and semi-arid. It grows in desert areas, adapted to sandy soils and limestone, and very low humidity. Nopal is a natural resource to protect the soil from wind erosion and desertification, especially in the more arid regions, with long periods of drought. Distribution: native to Mexico, the cactus plant has been naturalized throughout the Mediterranean region and North Africa, Algeria, Egypt, Eritrea, Ethiopia, Libya, Morocco and Tunisia. It is also an invasive plant in Australia. In America, this cactus is found in almost in all this continent, except in areas of very cold climates. Prickly pear (Opuntia ficus-indica) is one of the most important agronomic cacti in the world. People consume its fruit, known as prickly pear or tuna, and also its young stems called ” nopales” or “nopalitos”, are taken as a vegetable. The prickly pear cactus is a plant or shrub, erect or creeping, which can reach 3 to 6m high and occupies large areas. The plant comprises succulent stems, thickened, elliptical green pads that are arranged in an overlapping manner. In mature plants, some base pads can lignify, becoming woody and brownish color, looking like tree trunks. Pads are a mechanism of adaptation of plants to cacti desert climates, and are leaf-like stems. For example, in the leaves photosynthesis takes place. Botanically, the leaves are called cladodes. The thickness of these structures is to prevent water loss. Inside the stems and leaves prickly pear contains reserves of nutrients and water, allowing the plant to survive in extreme conditions such as poor soils, low humidity and drought periods. The cladodes are arranged facing the sun to make the most of the daylight hours. 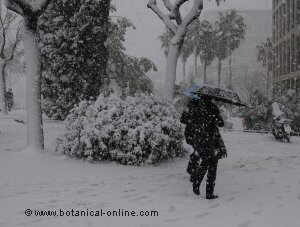 Thus, one can distinguish the cladodes formed in summer, that are oriented differently than those who grew up in winter. Pads tissue is thick and breathes through stomata, which are only small holes in the fabric surface which allow gas exchange (see animation). The stomata are closed during the day to prevent loss of water and open overnight to allow entry of carbon dioxide needed for the plant to carry out photosynthesis (namely Crassulean acid metabolism or CAM). * More information: adaptations of cacti. In the picture: Photo of nopal with fruits. It can be seen that it has few thorns, and fruits are growing of the upper margins of the leaves. The leaves or cladodes are ellipsoidal, measuring 30 to 60cm long by 20 – 40cm. wide and 2 – 3cm. thick. The fresh cladode is called nopalito, and the adult one, pad. This cactus can be used in food as a vegetable. Many plants of this genus have these structures, but this particular species is distinguished because it has little or no spine on its surface. This cactus spines are long (2cm. ), hard and sharp. Are grouped into small cliques, covered with a fuzz of tiny spines called glochidia. The stalk has cladode or buds, called areolas, which are able to develop new cladodes and flowers. The flowers are solitary. 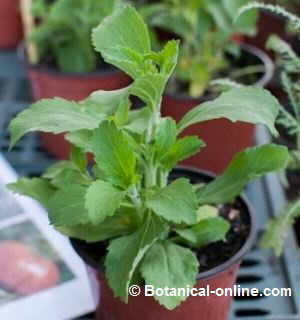 They normally grow in the upper margins of the leaves and the emerging fruit. Flowers measure between 7 and 10cm. long, sessile, hermaphrodite and different colors: yellow, orange, red or white. Flowering and fruiting is done in summer. The flowers open during the day and close at night. The fruit is a berry, ellipsoidal, yellow, red, purple or green, 10-15cm. long and 4-5cm. in diameter. This fruit is edible. The shell is thick, and its surface areolas are distinguished with very fine spines that must be removed before eating the fruit. However, it is possible to find spineless fruits, as there is a great variety of pear fig trees. The fruit pulp is sweet, gelatinous and greenish, and there are numerous seeds in it. The seeds are small, 4mm. in length. They are consumed along with the pulp. In general, this plant is very long-lived, and can live up to 80 years, although farms are cultivating crops for three years. 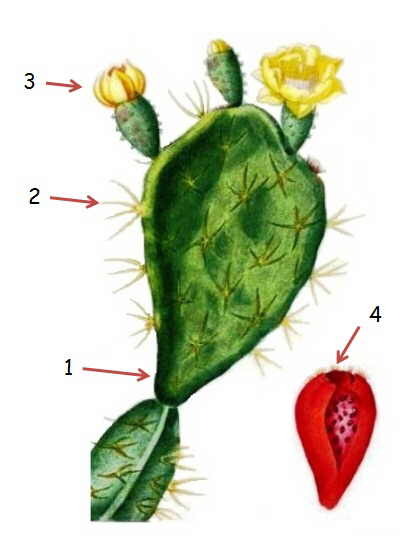 In the picture: illustration of cactus. (1) cladode or stalk, (2) thorns (3) flower and (4) fruit where you can see the seeds inside. 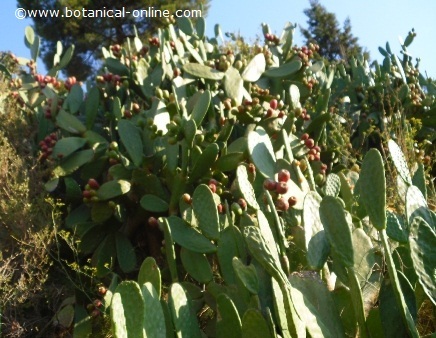 What is prickly pear used for? – Whole plant: Used to make fences. To this end, a variety of prickly cactus plant is used to land in orchards, forming a natural barrier. – Young pads: young succulent stems, called nopales, are consumed as a vegetable food. In very dry climates, the parenchyma of the cladodes (“pulp” of the cactus) is an excellent source of hydration. The gelatinous interior is rich in mucilage and cellulose, which gives emollient properties suitable for treating bruises and wounds. – Fruit: the fruit, known as prickly pear or cactus fruit is edible and it is used as food. From this derives other food like tuna cheese. * More information in Uses of prickly pear. Prickly pear is a plant that has genetic variety, and within the same species many specimens can be found with significantly different characteristics. The specimens that we know today are, in fact, the evolution of more than 8,000 years of culture, dating in Mexico, and still today being selected in the fields worldwide. Some differences between these varieties are clear, for example, wild prickly pears present thorns while the cultivars are spineless selected varieties. In markets the cultivated ones are displayed. – Water: nopalitos or young stems contain mostly water (90-95%) as well as their fruits (80-87%). – Carbohydrates: fruits are richer in sugars than nopalitos, although its contribution is very low. They contain fructose, glucose, galactose and sucrose. Because of its low sugar content, this food is nutritionally indicated in diets for diabetes. – Fat and protein content is very poor. 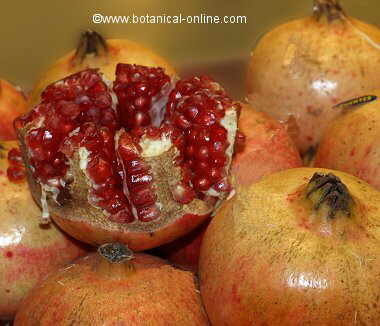 The seeds, which are consumed with the fruit, contain higher percentage of amino acids. 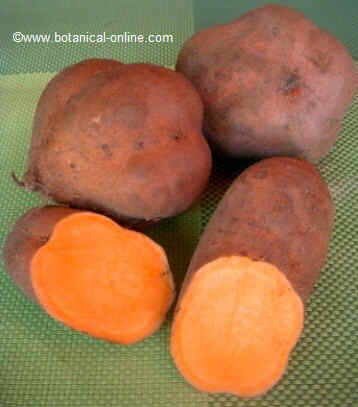 – Its soluble fiber content is very high, giving the pulp a gelatinous texture of the leaves and the fruit: arabinose, pectin, rhamnose, xylose and mucilage. It also contains insoluble fiber, mainly cellulose. 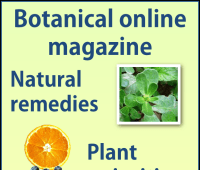 – Vitamins: Vitamin C, beta carotene, niacin, riboflavin, tocopherol. – Pigments: betanin, isobetanin, neobetanin, indicaxanthin, opuntiaxanthin. 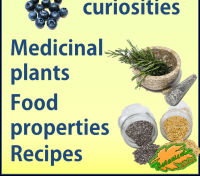 These components are extracted from the plant and used as colorants. For example, betanin is the colorant additive compound “red beet” (E-162).